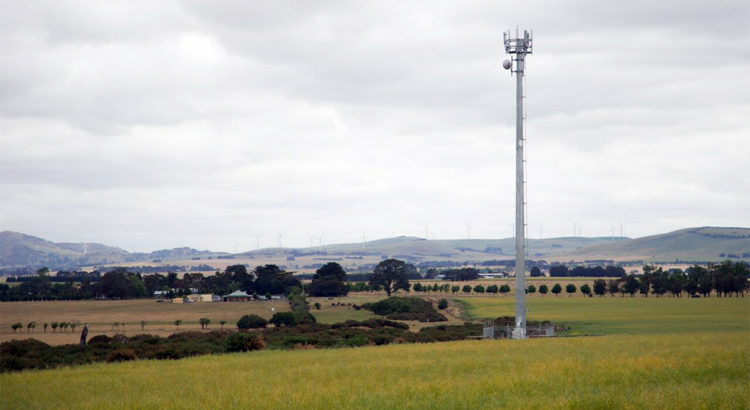 NBN is proposing to erect a 45m high fixed wireless telecommunications tower, similar to the one in the above photograph, at the corner of the Great Western Highway and Browns Gap Road in Little Hartley. The proposed development (DA 317 / 16 LGS:CEF) has come to Council for determination. Local residents impacted by the development were sent a letter from Council on 23rd December seeking comments which are required by 9th January – now extended by 7 days to 16th January, 2017. The Council letter did not include any site details. Interested residents are obliged to go to Council Chambers in Lithgow to find out any details. Nothing is mentioned on the Lithgow Council Website about this project. 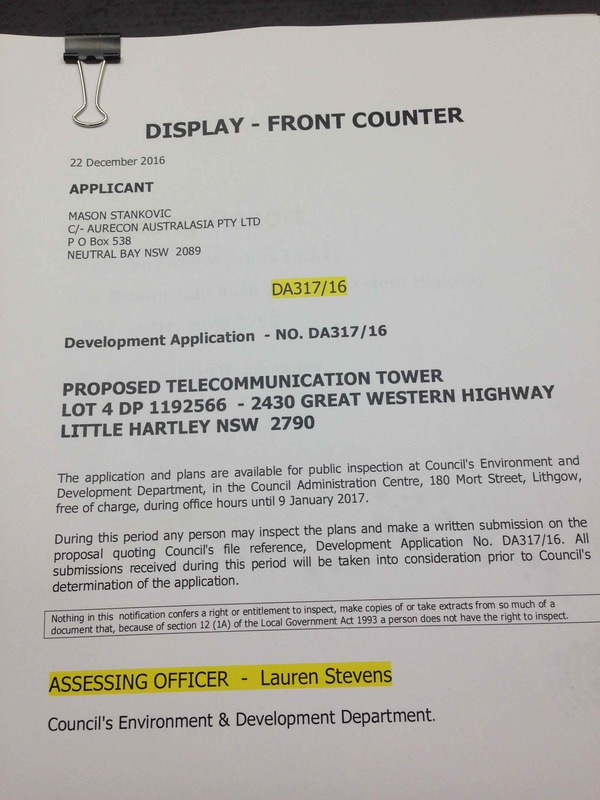 Notwithstanding that improved communications are needed in Hartley and across the Lithgow LGA, the lack of community consultation around this proposed development is a major concern. The timing is rather poor – seeking comments during the Christmas/New Year period does not give the community sufficient time to analyse and respond. The 45 metre tower is huge – it impacts the visual amenity in a major way – whether as a nearby resident or travelling into Little Hartley from the GWH or local roads. As we all know, once the tower is in place, it will be there permanently. The local community needs to be given the opportunity to be briefed by NBN on the proposal, with Q&A so that we all understand what is being put forward, the reasons for this, the options considered and the implications. This needs to occur before any Council deliberation on the DA. 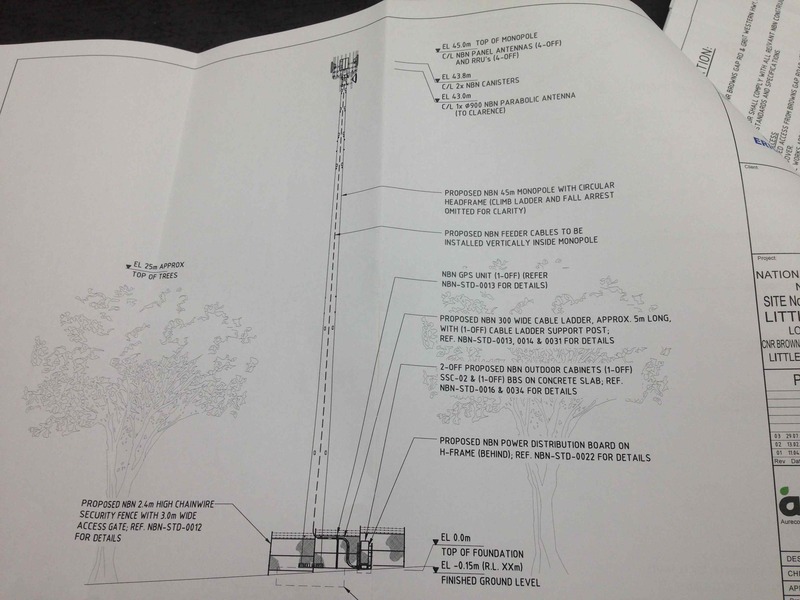 The following documentation was provided by a concerned resident of Apple Tree Lane, the street closest to the tower, and the most to be impacted by its visual presence.